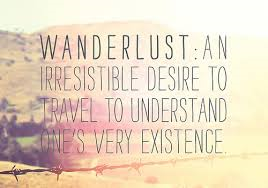 I deem ‘wanderlust’ the term of 2014, at least for me! Before this year it has never really applied to my life and therefore I never paid much attention to the meaning. 2014 has been a big year of change for me and I would now say that this word is me, I’m full of wanderlust, I’ve got that travel bug and it is not going anywhere anytime soon! Before this year I travelled to see places, now I travel to understand life; to see all that there is and experience as much as I can of the world. I find myself looking more at the bigger picture; how we got to where we are today and looking back at how people, places, and ways of life have changed. Looking at all these different ways of life that people have created, admiring the beauty of the natural landscapes, increasing my understanding, perception of life, and world view each and every step of the way. I look at the world now as a series of connections, we are all connected in some way and realizing this is what has helped me to grow as a person. My favorite thing to do now is just wander, wander until I get lost and I have found that you are never truly lost at all merely conquering your own unknown and unchartered territory. I love to see architecture, admire how buildings have changed throughout hundreds and thousands of years. When I see old buildings I try to imagine what they must have looked like to people who lived back in those times, what life was like when those places were in their prime. When I travelled around Europe I was in awe, seeing structures that were thousands of years old and still intact. I once walked across a bridge in Verona that was built in 100 BC, over 2000 years old, talk about a bone chilling experience! My first Euro trip of 2014 was my liberation trip. I finally broke out of the norm and took myself out of my own comfort zone. I felt comfortable travelling alone between the U.S. and UK but only because they were so familiar to me, two English-speaking countries with similar ways of life. When I made the decision to travel Europe alone I had no idea what I was getting myself into. When I stepped foot onto the first train leaving London on Jan 6, 2014, I could feel a fire starting to burn within me. When I finally reached my first destination: Paris, I knew I had made the right decision, this is what I was meant to do. Jump in head first and just do it. This is where my wanderlust was born. I travelled around Europe for two weeks by train and soaked up more history and culture than I ever have by any book. I learned that you must first break free of all expectations and just go for it if you really want to experience all that the travellers lifestyle has to offer. I now crave adventure, my goal is to explore the world and see and experience as much of it as I can. That is my bucket list, my wanderlust, the life of a traveller; what has become the meaning of life for me. There is a difference between ‘tourists’ and ‘travellers’. Before this year I would consider myself a tourist, going somewhere for a week or two weeks, seeing the sights and leaving, but now I have become a traveller. I do not go to a place merely to see it, my desire is to see the world and experience it. I want to get lost, I want to eat what the locals eat, go where the locals go, and do what the locals do. I want to experience all these different ways of life as if I was a local, as if these places were all my home and so far I have, even if it’s only for a day or two days, a week, or a month, in the US, outside of the US, everywhere has their own culture and own style/way of life and I just want to soak it all up. This year I have been to 62 places around the world, some multiple times, some have been for work or trips with my family, but I have travelled to them all with a different perspective. A more eyes-wide-open outlook, as if I was a child seeing them for the first time. Allowing myself to do this has changed my perception of life for the better. I have become so much more open-minded and now have an extremely compelling desire to learn everything there is about whatever place I’m in. I’m fascinated by everything; from the way the rain falls to admiring the beautiful man-made architecture of every city I go to. I have learned that keeping positive is the most important trait to have as it completely changes your outlook on life. And so my first year of wanderlust and travel has come to an end but another year is on the horizon, I’m going forth with the knowledge of what I have done and where I have been, but with a burning desire to increase that knowledge with each day that passes. My New Year’s resolution: to never stop believing, anything is possible!